Sometimes when someone dies you just know they have gone Home to glory. Other times though you find yourself floundering somewhere between doubt and dread, fearing that they may not have put their faith in Christ - even faith as small as a mustard seed. Uncertainty and fear add to the already heavy weight of grief. And it all serves to remind us that death is wrong. When Jesus wept for Lazarus it seems it wasn't just for the lost relationship, but weeping over the state of things. It was never meant to be this way. Death is a hard place. I've thought about all of this a great deal over recent years and my thoughts have been tested. What I have found, in the face of death, is that there are two things that bring me enormous comfort, no matter what the circumstances. The first thing is this. We are made in the image of God. One of the things this means is that we are made to be in relationship with Him. Every single human being ever. I see evidence of this most clearly when someone is thrown into crisis, especially sudden crisis. So often in those moments the person's immediate response is to cry out to God in prayer, even when they've never prayed in their life and they don't really know what they're doing. Or else they seek out the prayers of someone who prays. It's like we are all microchipped to God and when the need most hits we are drawn Home to our Father in heaven. It's the strongest magnetic pull in the universe. And as God is "not wanting anyone to perish but for everyone to come to repentence" (2 Peter 3:9) I wonder that God maybe responds in grace and mercy to those cries Home in the greatest of all crises - as one is facing their own death. Sometimes we see the evidence of God's mercy in the lives of those around us over many years and we know, in death, that they are going Home. Sometimes in God's great kindness we might see His grace and mercy in someone's last days or hours - a kindness more for our own benefit and comfort. And I wonder if there are times when we may not be aware of God, mercifully at work even when all communication between the one dying and the outside world has all but shut down. The Bible is clear. God wants all to turn to Him. But not everyone will take up this most precious of invitations. While on this earth we don't get to know ultimately who will take up this invitation and who won't. But I think there is more hope than we sometimes apprehend because God has made every single one of us to be drawn to Him and has done all that we need through Jesus' work on the cross in order to take hold of His invitation of eternal life with Him - even only with mustard seed sized faith in a final moment. There is hope, and that is comfort enough. The other source of comfort then is this. God's ways are perfect. All things happen in His perfect, loving and sovereign timing and wisdom. So when someone dies we can be confident that whatever has happened, it will have happened in God's perfect will and wisdom. I trust God with all my heart, soul, mind and strength. (Well, I try to.) And so I trust Him to get it right in every single instance and circumstance. Whatever has happened, when someone dies, it will have happened as God willed it to be. More than anything I might hope for in all my human weakness, I trust God. And that is the deepest comfort in the world. I will still be sad. Death is a hard place. But I will be comforted by the God of all comfort whose ways are always right. When friends move and they’re in the serious business of finding themselves a new church I always pray that they will find a church where they will be well ministered to AND where they can minister well, because going to church isn’t just about receiving. It is very much about giving as well. 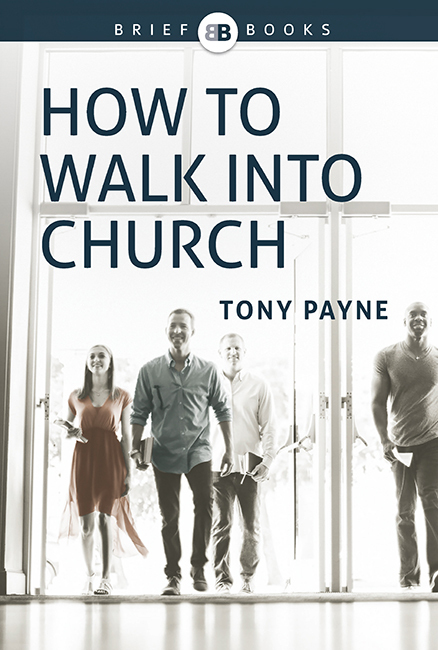 If you are someone who wants to do church well – or wants to know how to do church well – can I commend a fantastic little book to you called “How to Walk into Church” by Tony Payne. It’s 64 pages and it took me about half an hour to read. Thirty well spent minutes. * Go to church and go regularly. The very act of turning up every week is an enormous encouragement. One of the most important acts of love and encouragement we can all engage in is the powerful encouragement of just being there – because every time I walk into church I am wearing a metaphorical t-shirt that says, “God is important to me, and you are important to me.” And on the back it says, “And that’s why I wouldn’t dream of missing this.” Similarly, when we stay away for no good reason one week out of three (or more), we send the opposite message. * Prepare for church by praying – about who you will sit next to, about a good conversation you might have before church or afterwards over coffee (and there some excellent, God honouring conversation starters mentioned in chapter six) – and also by reading and thinking through the Bible passage to be covered in advance. * Determine to participate actively during the service – standing and singing with joy, bringing your own Bible to follow the readings and listening actively to the sermon by taking notes, making good eye contact with the minister, nodding in agreement or giving an encouraging and warm smile at an appropriate moment. * Be on the lookout for ways to serve – fill in for someone who’s rostered on for something but didn’t make it, get the person who has a coughing fit a glass of water, open the window if it feels hot and stuffy. Be the meerkat on guard and look for opportunities to be a blessing. Our aim at church should be to build up and encourage other people – rather than thinking about how much we’re getting out of it or whether we’ve had a chance to exercise our gifts. Love does not insist on its own way or press its own claims. It is not obsessed with its own enjoyment or convenience. Love does not complain or grumble, or stay home in bed because it couldn’t be bothered. Love seeks the good of the other – patiently, kindly, truthfully, joyfully, constantly. Who should read this book? If you go to church, no matter how well (or otherwise) you walk in that church door, you should read this book. It is such an encouragement to godliness. Even better, because going to church is a group activity after all, is to read it with a group from church – maybe your Bible study group – so that you can encourage each other in the ministry of walking into church well. And let us consider how we may spur one another on toward love and good deeds, not giving up meeting together, as some are in the habit of doing, but encouraging one another, and all the more as you see the Day approaching.